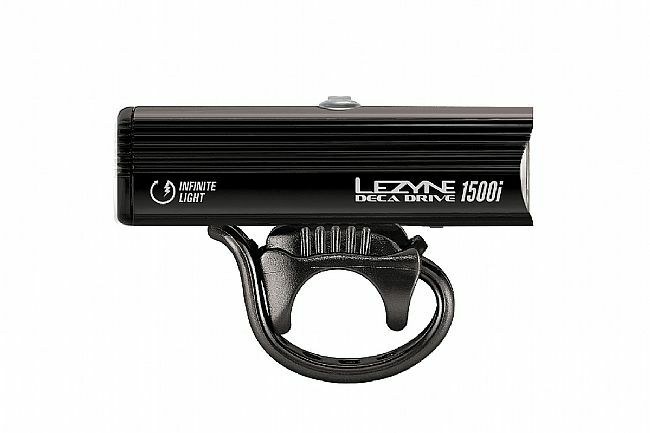 Lezyne’s Deca Drive 1500i is a super bright USB rechargeable front bike light offering 7 modes of illumination that span 15 to 1500 lumens - steady and flashing. Constructed of CNC machined aluminum, this headlight is highly durable and weather resistant for year-round dependability. Constant lumens technology maintains consistency in the lumen output. MOR optics lenses ensure crisp, dense beams and side visibility makes the rider more visible to their surrounding environment. To make things easy, the Deca Drive 1500i turns on in the same mode it was switched off in. 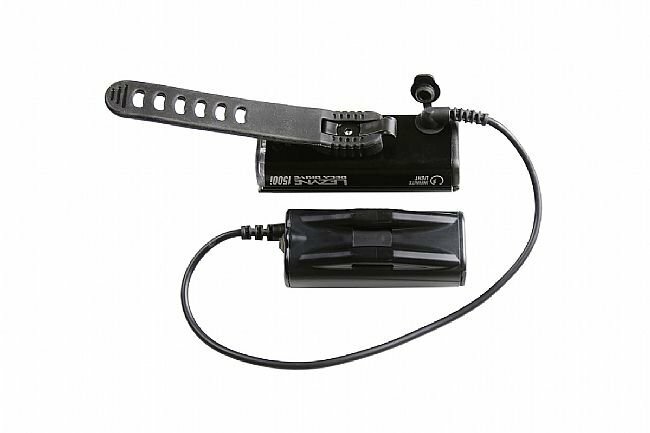 Another expedient feature is the alternative “overdrive race mode.” While in this mode, the rider can toggle between the brightest mode and economy with just one click of the button rather than cycling through all 7 modes each time..
USB charger with wall adapter. Includes bar mount strap (fits standard bar shapes including aero). 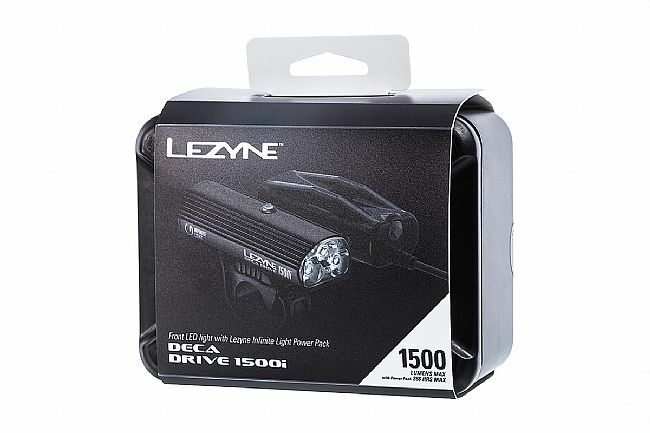 Compatible with Lezyne’s Infinite Light Power Pack. Blast: 1000 lumens, 2hrs 30mins run time. Enduro: 600 lumens, 3hrs 45mins run time. Economy: 250 lumens, 10hrs run time. Femto: 15 lumens, 148hrs run time. Flash: 150 lumens, 33hrs run time. Pulse: 150 lumens, 38hrs run time. Overdrive: 1500 lumens, 1hr 40mins run time. I use a pair of these mounted upside-down on the underside of a wing type Aerofly handlebar. I can pivot or tilt the lights without any tools so they provide adequate spread and variable angle when riding the bike path through the woods at night. I have the lights set at race mode, so if I am approaching oncoming riders or joggers, I can easily reach under the bars to dim the lights without taking my hands fully off the bars. 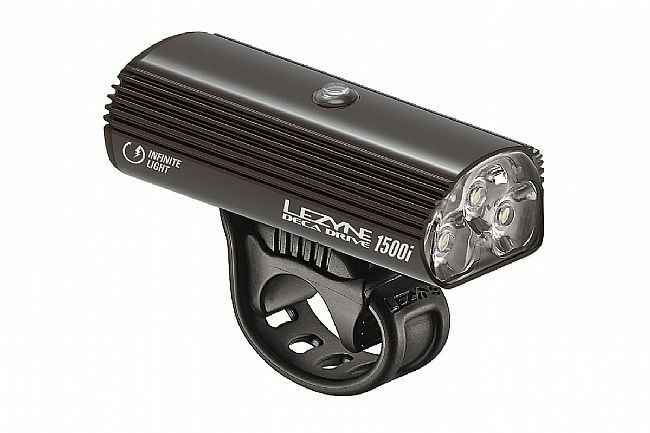 With a total output of 15001500 lumens, left and right, its probably overkill for street use, but, in my experience, when drivers see a very, very bright non-blinking light, they tend to exercise more caution because they perceive it as something much bigger than a cyclist. Ive had oncoming left turning motorists come to a complete stop almost a block away in order to let me pass. Funny, when I have the lights blinking, the opposite happens, and they try to squeeze in that left turn just as I approach the intersection, probably because they know Im a bike. So, keep em bright and steady my friends.